A GtkScale is a slider control used to select a numeric value. To use it, you'll probably want to investigate the methods on its base class, GtkRange, in addition to the methods for GtkScale itself. To set the value of a scale, you would normally use gtk_range_set_value(). To detect changes to the value, you would normally use the "value_changed" signal. The GtkScale widget is an abstract class, used only for deriving the subclasses GtkHScale and GtkVScale. 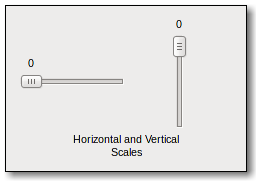 To create a scale widget, call gtk_hscale_new_with_range() or gtk_vscale_new_with_range(). GtkScale supports a custom <marks> element, which can contain multiple <mark> elements. The "value" and "position" attributes have the same meaning as gtk_scale_add_mark() parameters of the same name. If the element is not empty, its content is taken as the markup to show at the mark. It can be translated with the usual "translatable and "context" attributes. where to draw the mark. For a horizontal scale, GTK_POS_TOP is drawn above the scale, anything else below. For a vertical scale, GTK_POS_LEFT is drawn to the left of the scale, anything else to the right. The fields of the GtkScale struct should only be accessed via the accessor functions.